Who wore it best … Roy or Mr. EE! DeeDee Dalrymple, hostess extraordinaire, basketball fan, and author of Effortless Entertaining, offers the perfect game time menu your fans will love. It’s March Madness and I’m excited to share the Effortless Entertaining menu that I’ll serve when friends join us to watch the games. Game time is the perfect time to effortlessly entertain. You’ve got built-in, super casual fun, and there’s no need to even set a table. Just let everyone graze, stand, or sit wherever they’d like while watching their favorite teams. If you’d like your fans to sit together for dinner, this menu is also easy to serve during half-time or between games. For your March Madness gathering, I offer Ribs and Barbecue with sides fit for spring. 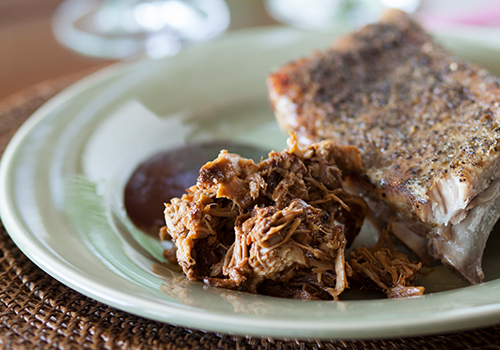 If doing both the ribs and the barbecue feels like a lot to you, just serve the slow cooker barbecue. What’s that? You don’t want to cook at all? No problem! Just use this menu as a guide for what a caterer could prepare for you or as a guide for procuring similar items from local sources. You can also divide and conquer. You can provide the barbecue and let your friends chip in for the rest. Step Two in the “Ten Steps to Effortless Entertaining” … Your Friends are Excited to be Invited. They are also happy to help! If you like these recipes, send them to your friends to prepare. They will love being given a new and delicious recipe. Step Four is Make it a Meal to Remember, which most importantly means, a meal your guests will enjoy and not one that causes angst for you. One of the things I always say when I speak is to entertain effortlessly, you must decide what works for you. If you like to cook, do it! If you don’t, then don’t! It’s not about entertaining the way I do or the way your best friend, Suzie Q, does. It’s about finding your sweet spot and doing the things that you enjoy. Some like to cook, others like to set tables, some like to arrange flowers. Some just like to invite friends and open the door. Do what you enjoy, source out what you don’t. Effortless Entertaining is about hosting a party that your guests and you will enjoy! Rah Rah Carolina – Go Heels! Cocktails and Mocktails – Let’s set the bar! To set an attractive bar, I recommend including three or four glass pitchers or carafes for water and fruit juice mixers. Carbonated beverages are best left in the bottles, but a glass pitcher or carafe is a nicer touch than a carton of Tropicana grapefruit juice. Carafes are also a nice, space-efficient choice and one of my favorites is this attractive and well-priced Pinch Carafe from Crate and Barrel. Vietri Lastra Melamine White Dinner Plate – Casual dinnerware for a casual party! I love white plates and these melamine plates from Vietri fit the bill when entertaining casually … stylish, light weight. Tava Charger from Pottery Barn | Bamboo Tray from Pier 1 – When guests are eating in their laps you may want to offer a tray such as the Bamboo trays we all have used time and again. You may also want to consider a woven charger. It provides a little something extra for the plate to rest on without being as bulky as the tray. To make the slow cooker barbecue sauce I like to mix a thicker sauce with a vinegar-based sauce. A few of my favorites available at many grocery stores are George’s, Scott’s, and Bone Suckin’ Sauce.